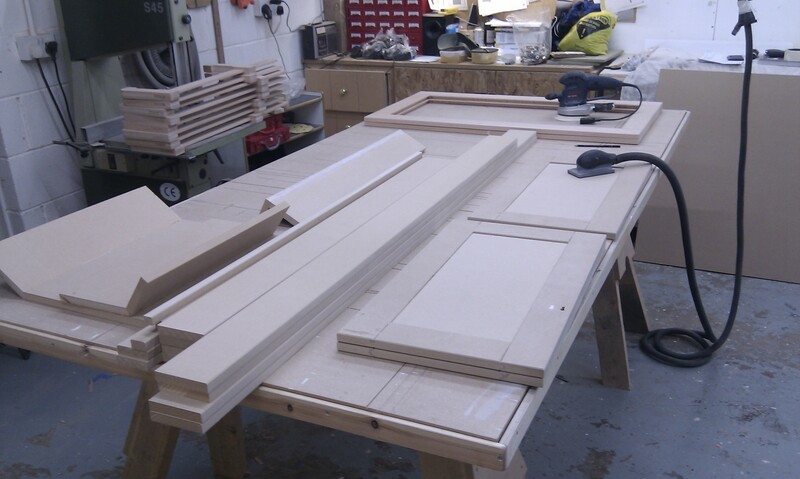 Here we can be seen the MDF face frame components and the two beech frames (behind) being prepped. I like to apply two coats of WB (water based) acrylic primer one after the other and allow to dry overnight so the MDF edges go nice and hard. The primer is knocked back flat with 240 grit on the faces and 180 grit on the MDF cut edges. I am often asked how best to seal the MDF edges. The important thing is to harden them off so that when rubbed back you stop that perpetual fluffing or flowering of the surface. 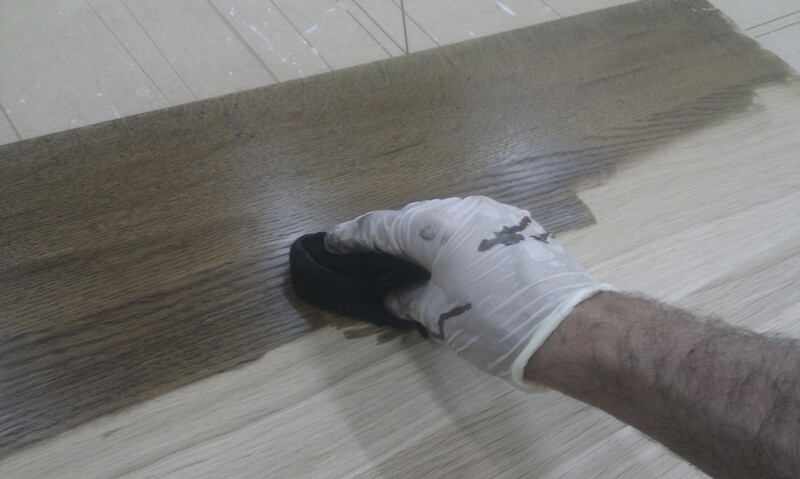 There are many ways to do this… wallpaper boarder adhesive, PVA, shellac sanding sealer, polyurethane varnish, acrylic varnish, wood stopping fillers… It’s all about binding those fibers so you can knock off the nibs (denib) to leave a smooth edge. 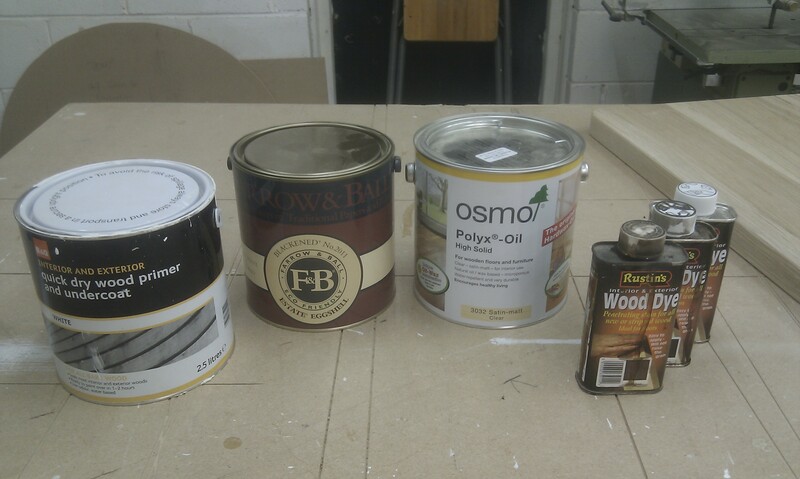 Pictured above are the finishing products to be used. • 2 coats of acrylic primer. • 3 coats of water based eggshell. • 1 coat of NGR (non grain raising) spirit based dye (rubbing raised grain from a WB dyed would be a disaster!). • 2 coats of Hard Wax Oil (a third coat is applied to surfaces that receive heavy traffic such as worktops and desk tops for example). 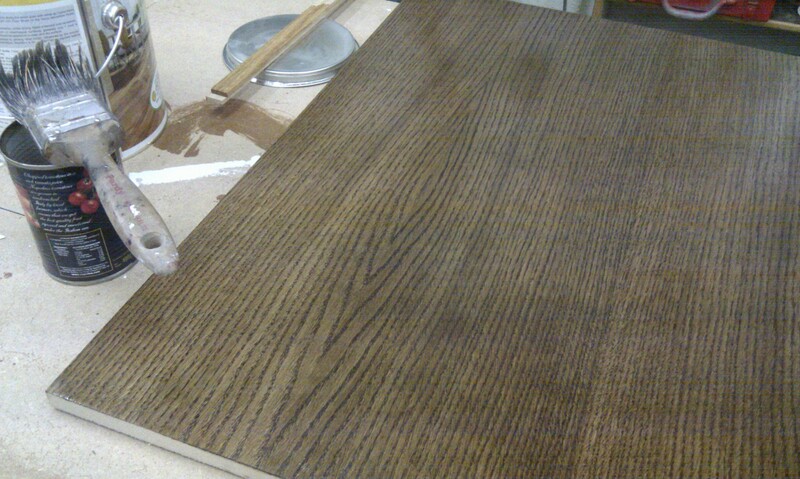 Where possible we like to use WB (water based) finishes. They have a much lower VOC (volatile organic content) base making them kinder to the environment and less of a hazard to us in the shop! The quality of WB products have improved remarkably in recent years. However in some instances alternative finishes are more appropriate as long as they are applied safely and disposed of correctly (that goes for WB too!). Applying the NGR (Dark Oak) dye which is left over night to dry. The first coat of Hard Wax Oil is brush applied and allowed to soak in for 10-15 minutes before wiping of any excess with a clean rag. Addition coats are applied once dried, usually after 12-16 hrs depending on humidity and temperature (ideally 45-50% humidity and 22-25 degrees C). It’s occurred to me that I forgot to get some snaps of the paint finishing! However this really is quite straight forward, if a little time consuming. It’s important to be thorough with the preparation as rushing at this stage will quickly ruin a project! It still surprises me how time can disappear during the finishing process. Once primed and rubbed back to a smooth finish (as mentioned above) we apply the Eggshell coats by brush and roller (the spongey one). 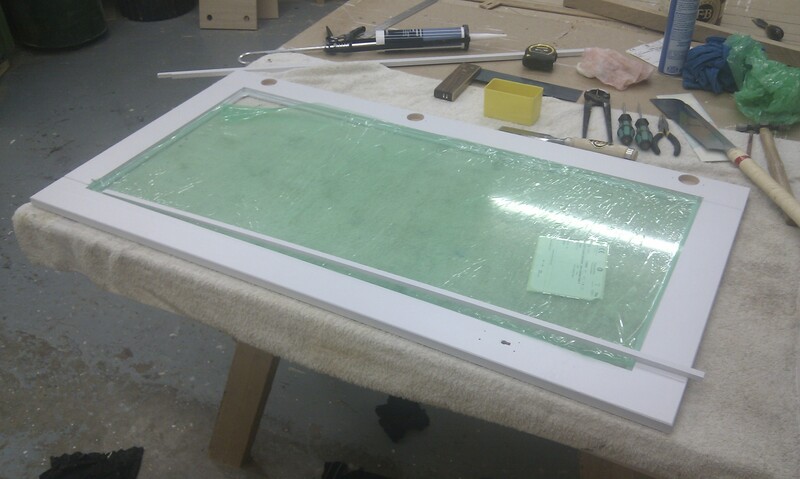 Seen above is one of the paint finished display case doors recieving 4mm toughen Pilkington glass. The glass sits on a bead of clear silicone (to stop rattles!) and held in place with pre finished PSE (planed square edge) glazing bead. Handles and escutcheons (key hole covers) should also be given some thought. They really can make or break a piece so it is important that the right design and finish is chosen or custom made to suit. There are literally thousands to choose from a couple of pounds to mega bucks and because of this I don’t usually include the price in a quotation unless a design is agreed during consultation. I can advise and guide a client on choosing a handle however the choice is often seen as a very personal one to the individual or project location . It’s not unusual for us to return to a project weeks later to change or fit the handles if the choice has been a particuarly tricky one! 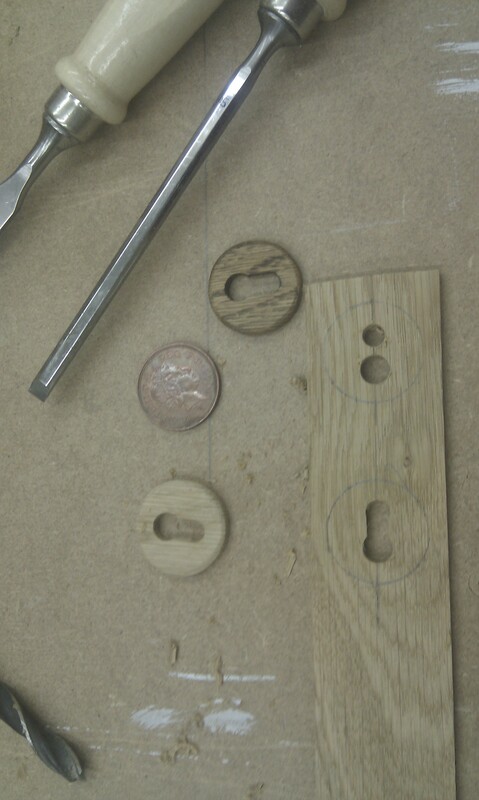 For this project the client has specified Oak button knobs stained to match the scheme, below can be seen the escutcheons being custom made to match in the shop. 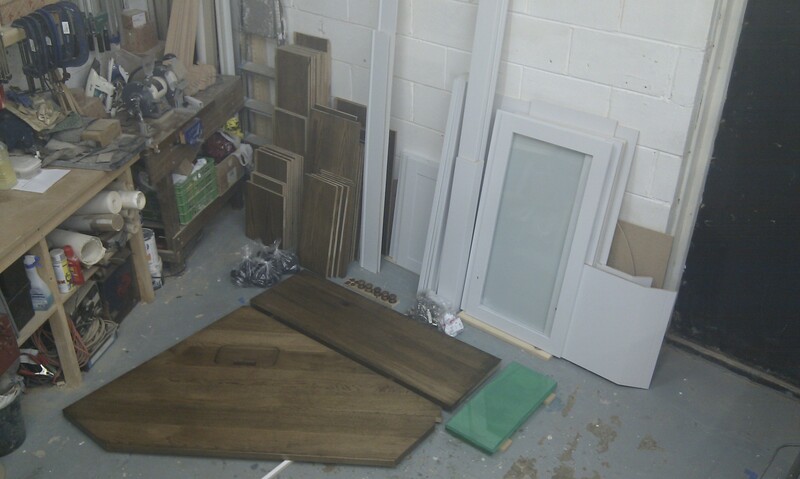 Once the finishes have cured the components are checked ready to be assembled and installed. The green stack to the right are the wrapped glass shelves. Centre are the hinges, knobs, escutcheons and other bits of hardware. Bagged up to the left are adjustable cabinet feet for levelling (click picture to view large). The majority of twin alcove installs take approximately a day and a half to fit. I like to allow a diary window of two days for any unforeseen circumstances. The final two days of week 3 will be used for the install.We like to get projects out of the shop as soon as they are ready as this avoids any knocks in the shop, frees up space and keeps the accounts in the black! However sometimes there can be delays such as prior groundworks to be completed on site, which a pain as they are can’t always be helped. The final post in the Alcove Furniture WIP series will be the site install which takes place next week.